Last week, we reported that Provo, Utah is one of the cities where millennials are buying homes in large numbers. This and other factors has led to big home-price gains in the Provo housing market. Home prices in Utah rose faster than the national average in 2018, and during the first part of 2019. According to Zillow, the median home value for the state of Utah rose by 14% over the past year (as of March 2019). The nationwide median rose by 7.2% during that same 12-month period. According to the latest data, home prices in the major cities of Norther Utah have been rising at a much faster pace than the nation as a whole. Additionally, there have been strong home-price forecasts for the housing markets in Salt Lake City, Provo, Ogden and Orem. The median home price for the U.S. rose by around 7% over the past 12 months. In contrast, the median home value in all four of the Utah Cities above rose by at least 15% over the past year, according to Zillow. Ogden, Utah is one of the more “extreme” examples of this supply-and-demand imbalance. 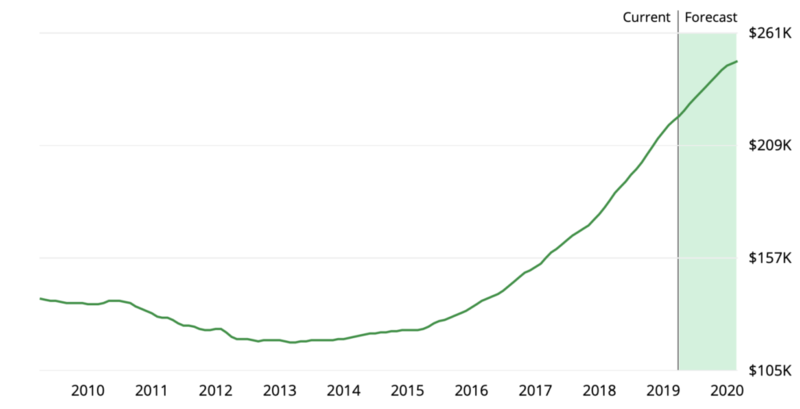 As of February 2019, the Ogden housing market had about a 2.5-month supply of homes for sale. That’s well below the 5- to 6-month level that economists consider to be a balanced market. In these and other cities across Northern Utah, the real estate market tends to favor sellers over buyers. For now, at least. If more inventory becomes available over the coming months, it could tilt the scales.